Neuronal transfection is crucial for the study and understanding of neuronal cell function, especially in disease states. For those who routinely use transfection as a study method, a reliable, efficient, reproducible, and cost effective method and reagent are critical. When it comes to ease of use, reliability, reproducibility, and cost-effectiveness, conventional lipid based transfection reagents are a highly recommended and are widely used as a first choice in in vitro molecular delivery experiments. Typically, cationic and neutral lipid mixtures are used to interact with nucleic acids and facilitate delivery inside cells. The advantages of cationic lipid transfections are simplicity, reproducibility, low cytotoxicity and lowest impact on cellular substructures, no need for expensive equipment or reagents, and high transfection efficiencies in established cell lines. 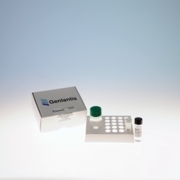 The Genlantis transfection reagents are carefully screened and formulated to provide the best advantages of cationic lipid transfection methods. Our lipids are manufactured using the highest standards and are tested rigorously so users get the best and most consistent results. To further enhance options, Genlantis offers neuronal specific transfection reagent NeuroPORTER�, a cationic lipid that works in a wide range of cell lines. NeuroPORTER is suitable for transient and stable transfections and offer the best possible in vitro transfection efficiencies (up to 85% in established cell lines, and up to 30% in primary neurons) using this type of technique. Between the many available citations and the help of our scientists, Genlantis will assist you in identifying the best neuronal transfection reagent for your application. in neuronal cell lines and glial cells.